courtyard with a Mangalore tile roof makes for a nice seating arrangement. I believe the red and white checked table linen is a trademark. We were seated immediately and menus were brought in. Frankly my salivating mouth took on a life force of its own when it took a look at the menu. A wide array of steaks, burgers, pastas made it difficult for me to make a choice, because I seemed to like it all. After at least 15 minutes of deliberation, we settled for the chicken salad and garlic cheese bread for starters (this is now Anoushka's new staple diet). 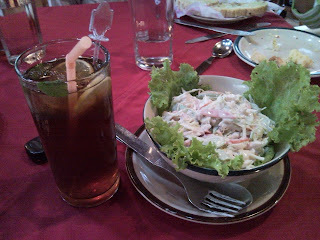 We also had a new standard for us - lemon ice tea. The chicken salad was really nice with the portion being good. It had a good mix of shredded chicken and veggies done up in a nothing-spectacular mayo dressing. The cheese garlic bread were bigger compared to the conventional slices served in most restaurants. So three out of four of these made a good lunch for Anoushka. Next, for the main courses - Sudhakar opted for the steak and eggs. 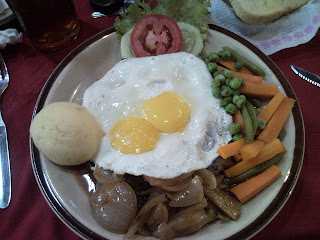 Beef steak with a double bulleyes, steamed veggies, mashed potatoes and sauteed onions. 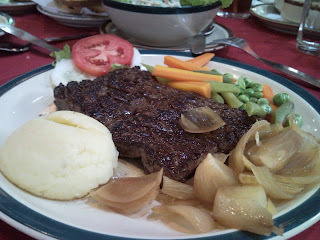 I opted for the Chateaubriand Supreme - Mini, which again was a healthy portion of beef steak, mashed potatoes, steamed veggies and sauteed onions. The Only Place gives you the option of add-ons and in our case Sudhakar opted for a jacket potato with sour cream and I opted for hash browns. 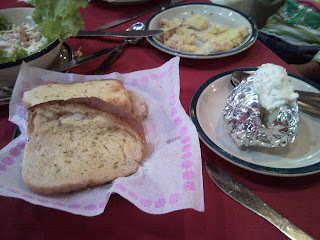 And of course there was the mandatory garlic bread accompanying both entrees. Now for the verdict. The portions were healthy but what I was really disappointed was in the fact that both our meals were not piping hot. In fact they were not hot at all and had me wondering whether we had a microwaved meal placed before us. Sudhakar felt his steak to be slightly stale further emphasizing that we could have been served a microwaved meal. 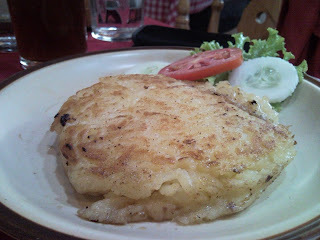 The hash browns too were just about warm and was not salted. Its only when you get to the centre of it will you come across some molten cheese. Sudhakar steak was juicy and much more easier to the knife than mine was. 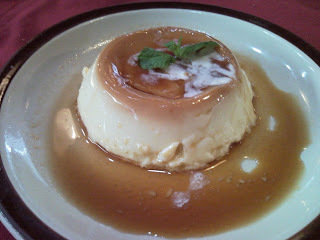 The mashed potatoes were nice and creamy. 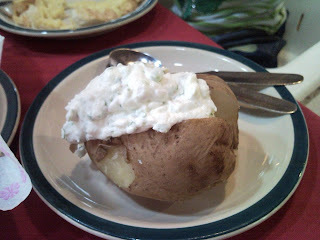 The jacket potato thankfully was hot but the sour cream was excruciatingly sour (yes I know it is supposed to be that... but this was not nice sour, this was bad sour, and I should know since I love all things sour). I had read a lot about the pies here and that's why I opted for peach pie for dessert and Sudhakar asked for his favorite creme caramel. He said it was decent. But mine was a disaster on a plate. The pie base was definitely stale and the peaches were dunked in sugar syrup and just placed on top of the base. 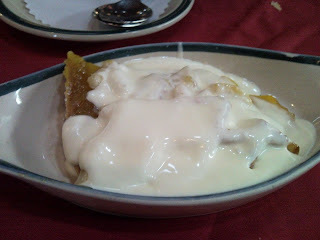 The whole thing was drowned in cream in all probability to cover up the atrocious dessert. The base was rock hard and would have needed a hammer and chisel to carve through. Overall I was really disappointed with this visit to The Only Place. I am sure if the meals was served steaming hot like it was supposed to be, then it would have been a better experience. The dessert was really sad. This meal cost us approximately Rs 1200. The loo for ladies was outside the main seating area and if its raining you will need your umbrella to get there. Spacious and clean. I will definitely visit again since I am inclined to believe we went on the restaurant's bad day. I spoke to a couple of friends who feel that they too have had off days at The Only Place, so maybe we should give it another shot.